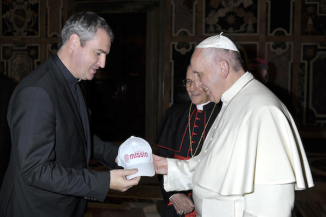 Father Andrew Small, OMI, National Director of the Pontifical Mission Societies, presents Pope Francis with a gift in honor of the launch of MISSIO in 2015. The Pontifical Mission Societies provide for a global network of people who are making the difference for the poor and forgotten. 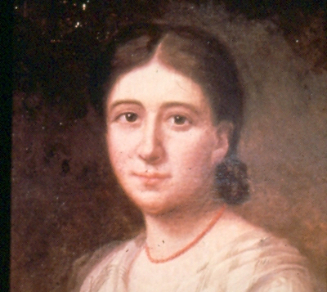 Young Pauline Jaricot learned about the Missions of her day from letters from missionaries. She decided to do something to help their work, right from her home in Lyons, France. Pauline gathered her friends and workers in the local silk factory into small groups. Everyone in the group pledged to pray for the Missions daily and to offer the equivalent of a penny each week. Each group member then found ten other friends to do the same. Within a year, she had 500 workers praying daily and offering help each week. Pauline's efforts became The Society for the Propagation of the Faith. The first collections supported the missions of China and the United States. 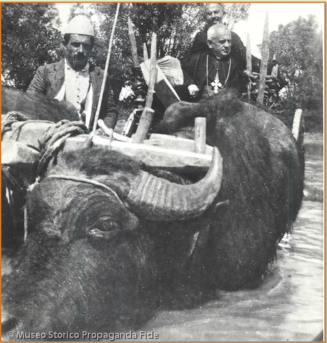 By 1922, The Society for the Propagation of the Faith – and three other societies established to help the Missions – became Pontifical, or the Popes official ways to help the Missions, moving their headquarters to Rome. In the first 100 years of its existence, The Society for the Propagation of the Faith sent $7 million to help what was then the young church in the United States. Catholics here started contributing in 1833, with a gift of $6. Today, U.S. Catholics provide 25 percent of the support sent to mission territories that cover more than half the globe, with a majority of that help provided to Africa and Asia. With MISSIO, today's technology meets the Church's age-old mission of helping others, delivering direct and immediate access to those making a difference in the world's most vulnerable communities. MISSIO places Pauline Jaricot's inspired crowdfunding idea into an extensive online platform with the ability to reach more people and develop relationships across borders of distance and language. You might come to MISSIO to donate, but MISSIO offers you more: the connection to others whose daily lives might be very different from yours. As Pope Francis suggests, the culture of encounter means not just seeing, but looking; not just hearing, but listening; not just passing people by, but stopping with them; not just saying, "what a shame, poor people!" but allowing yourself to be moved with compassion. MISSIO is a New York Not-for-profit and 501(c)(3) that is included in the Group Ruling of the United States Conference of Catholic Bishops affording it the status of a US Charity. 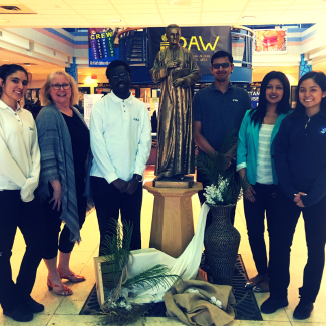 When the Chaplain and students of Father Michael McGivney Catholic Academy in Markham, Ontario, Canada, researched opportunities for their Christmas service initiative, they were thrilled to come across MISSIO. The students chose to utilize MISSIO to engage their school community and connect with communities around the world. Dushani suggested that the way her students included the entire school in the process is “something other schools could get behind.” The student leaders chose a few projects and issues they connected with, and then the school wide community chose two of those projects through Twitter and Instagram Polls. One project was given to 9th and 10th grades to fundraise for. The other was given to the 11th and 12th. In the future, Dushani envisions building MISSIO into the curriculum and corresponding more with the missionaries. "A part of our Catholic identity is caring for the poor, and MISSIO helps make that a reality in the modern age." 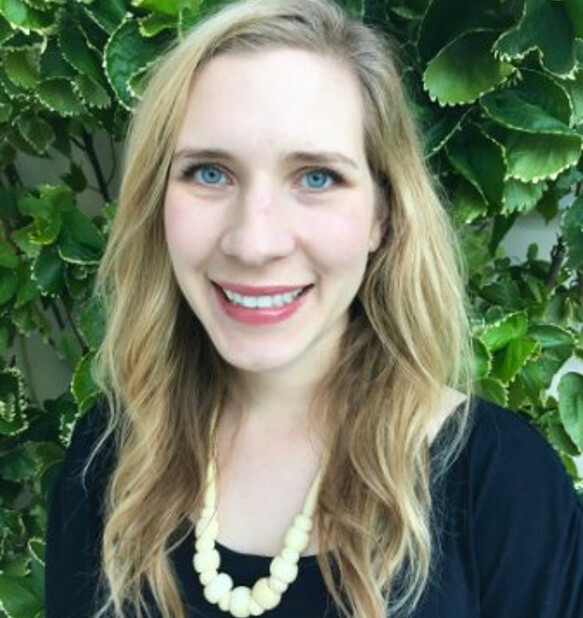 Elena Bettis discovered her love for international development and mission as a college student while working on child health projects in Costa Rica, Guatemala and Israel. Elena now uses her passion and international experience to direct mission work in Liberia. She has published and successfully funded four projects thanks to the MISSIO community. "MISSIO has been great in helping us share about and get financial support for our work,” Elena says. “We could not be more grateful for the connections made through MISSIO to donors and prayer partners across the world." Thank you, Elena. Supporting missionaries like you is what we’re all about. "Thank you all very much. God bless you. Remembering you all in my prayers." On the African Island of Madagascar, more than 900,000 abandoned and orphaned children live on the streets. Child trafficking of these Malagasy children is unfortunately common. Claudine first encountered this pressing need while volunteering in a local hospital with a missionary priest. That experience brought Claudine to her own vocation. She became a Sister of Saint John the Baptist and now serves the abandoned children in Fianarantsoa. Sister Claudine directs a residence and a school. 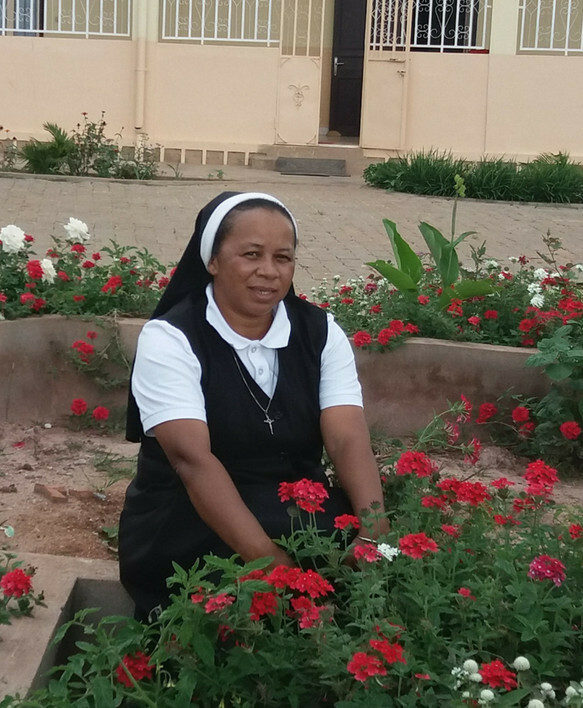 Sister Claudine has published four projects and, with the help of the MISSIO community, has made extensive improvements to both the school and children’s home. She has developed a small farm to help feed the 300 children in her care. And she has built and equipped a computer classroom for the school. "I and the children thank you MISSIO." Thank you for sharing your story, Sister Claudine! "I feel our story could inspire other Parishes to do likewise." 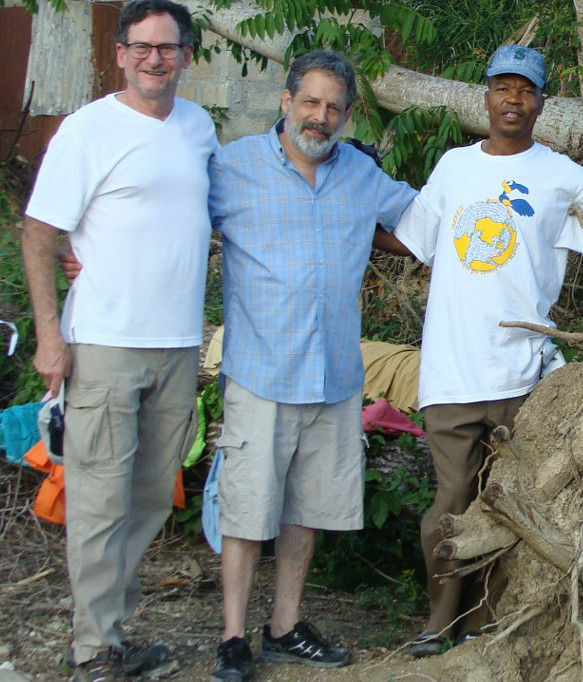 Larry Reyman (pictured, far left) is proud of the work he and his church have been able to accomplish with their Sister Parish in Haiti, but he felt there was more he could do. Larry describes himself as “old school” but he realized that doing something online might be the answer to spread the word to more people and better support their collaborative projects in Haiti. Larry discovered MISSIO in an email and "was very impressed." He confirmed MISSIO's Papal approval with his Archdiocesan Missions office, and the rest is history. The St. Anthony & St. Anne Sister Parish Covenant has helped fund the construction of a brand-new school and continues to help pay the teacher salaries. They are currently raising money to build a cistern for clean drinking water at the school. For other parishes who want to do more with their Twin Parish relationships, Larry recommends, "Don’t be discouraged or distracted…Start small, take direction, pray, trust God, and act." Thank you for the great advice, Larry! Larry Reymann – Renton, WA. This is a great way to share with our larger family of the Church. Godine and Hijung had a dream of helping build schools. With Missio, the young couple began communicating directly with Sr. Claudine and supporting her school in Madagascar. As part of their wedding celebration, they asked their friends and family to help contribute to this cause as a substitute for a gift registry. What a wonderful way to serve others, and what a beautiful way to celebrate a marriage. 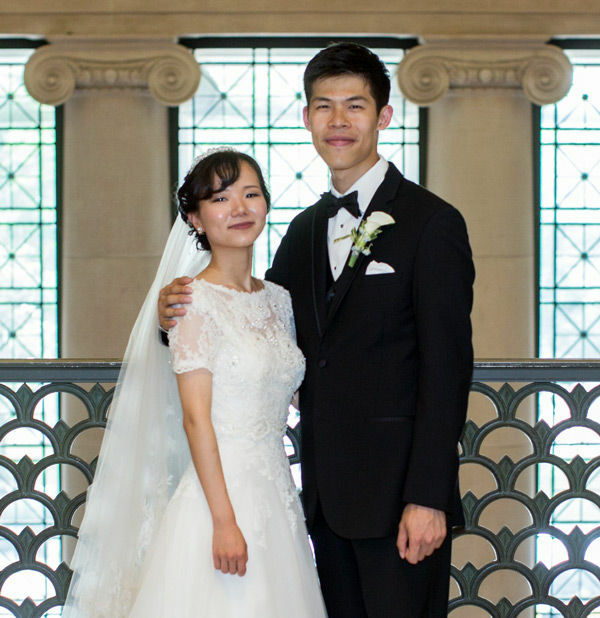 Congratulations, Godine and Hijung! Connect with change-makers all over the world. Launched by Pope Francis, MISSIO connects you with communities around the world and helps you make a direct and lasting impact on the lives of others.